I've seen this project all over Pinterest and have tried a couple of different methods. All promised that you could use regular Sharpies and it would work. None of them worked. They'd end up washing away or the marker would chip off. It was seriously disappointing! One day, I read that the secret was to use oil-based Sharpies. I was worried about trying again, just to watch all that hard work wipe away. But, it actually worked! 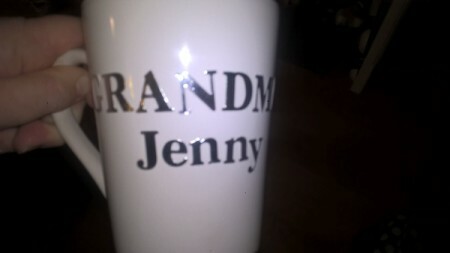 My kids made a mug for their grandma and wrote their own messages on the other side. It's a nice way to personalize your cup. You can use the sticker method, or design it any way you might like. Total Time: About 1 hour, plus drying and baking time! 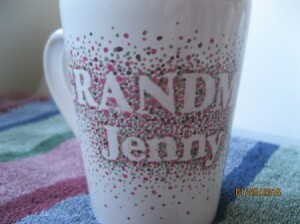 ceramic mug - I found this one at Dollar Tree, apparently, "the cheaper, the better". 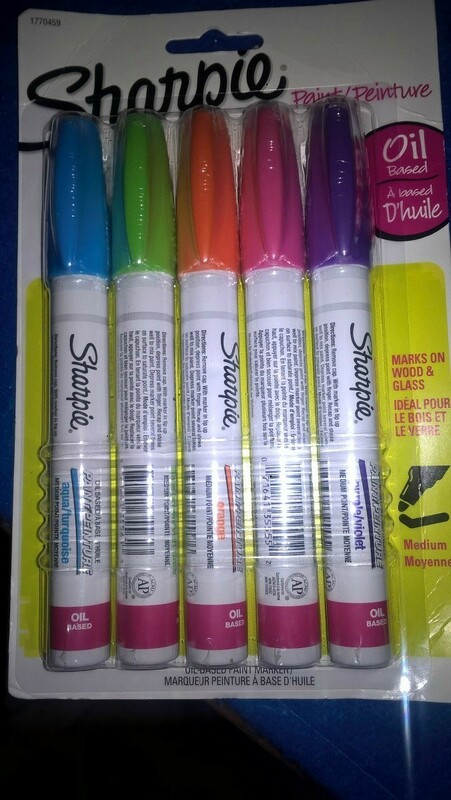 oil- based Sharpies, they are kinda expensive. I suggest you use one of those 50, or even 60% off coupons for the craft stores! Wash and dry your mug. 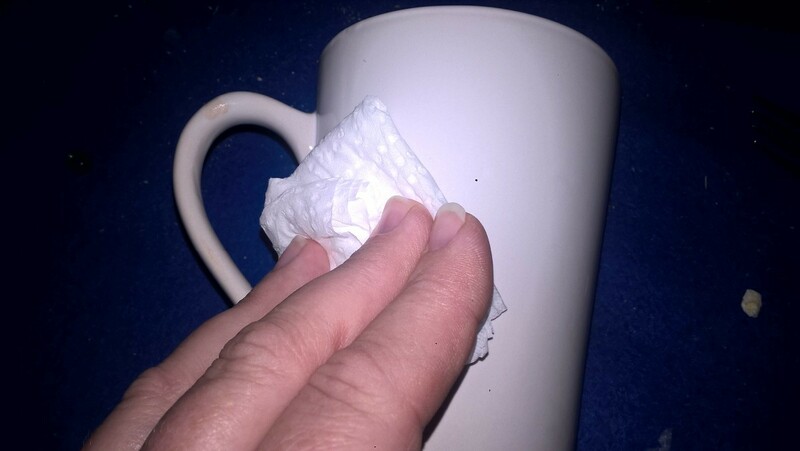 Clean the outside of the mug with a cotton ball with rubbing alcohol on it. This cleans the surface of oils and helps the ink adhere. Try to not touch the area where you will be creating your design. You don't want the oils from your hand to get on your nice, clean surface. 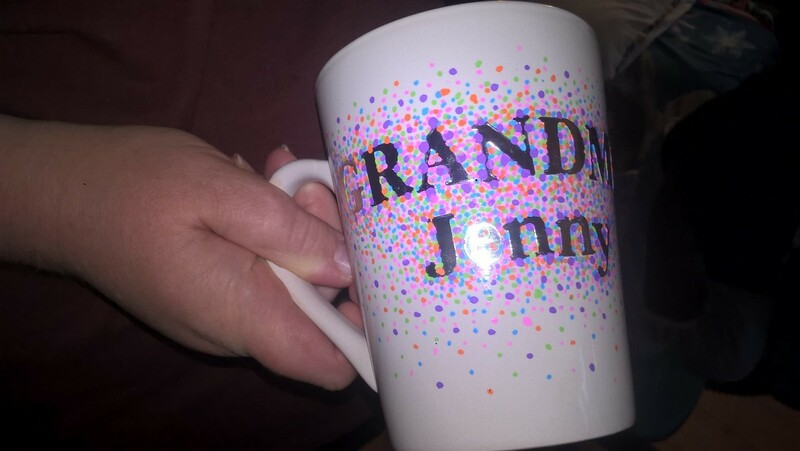 If creating a dotted message, apply some stickers to the surface of your cup. Put them on the cup lightly, so you can move them around, if need be. Once you are happy with the placement, press down on the stickers. The markers will bleed underneath the stickers if they aren't on there well. Start with your first color and start adding dots. The ink will stay wet for a minute or so, and will smudge if your hand goes over that spot. Try to be careful. If you mess up, wipe it away quickly with a tissue. Or, you could use nail polish remover on a Q-tip to remove the mistake. It works best to concentrate the dots around the letters, then gradually add less and less, the further you go away from the letters. Use your other colors, if using more than one. 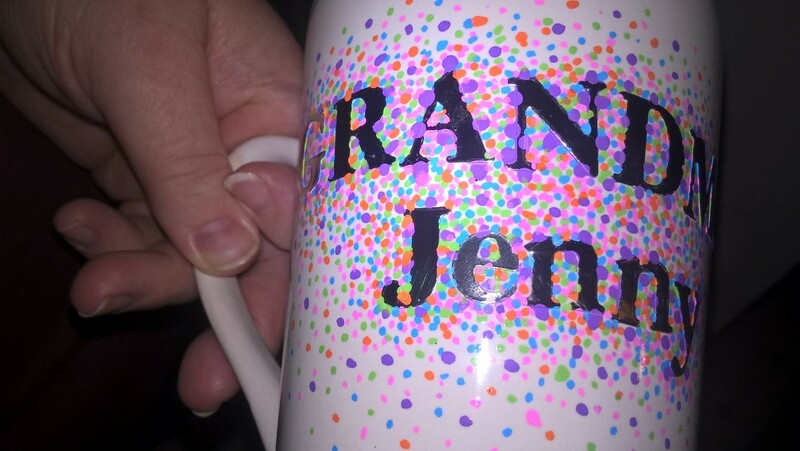 I avoided putting any marker on the top of the mug, where you put your mouth. I just think it's the safest way to go. 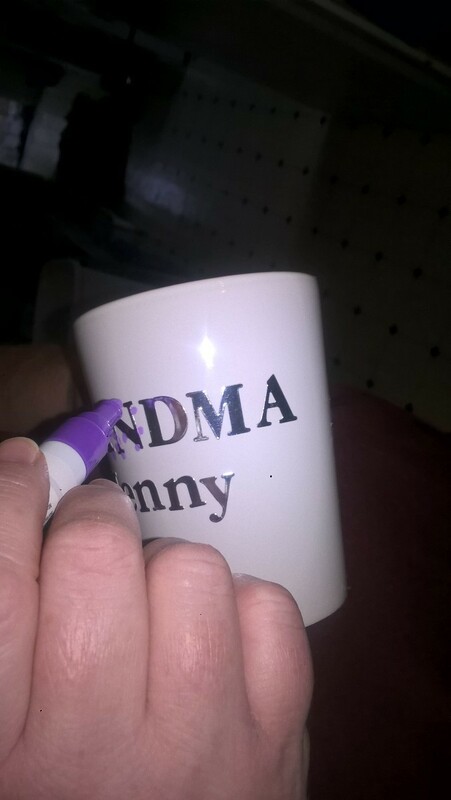 I don't want to drink marker, along with my coffee! Once done, let the mug dry for 24 hours. 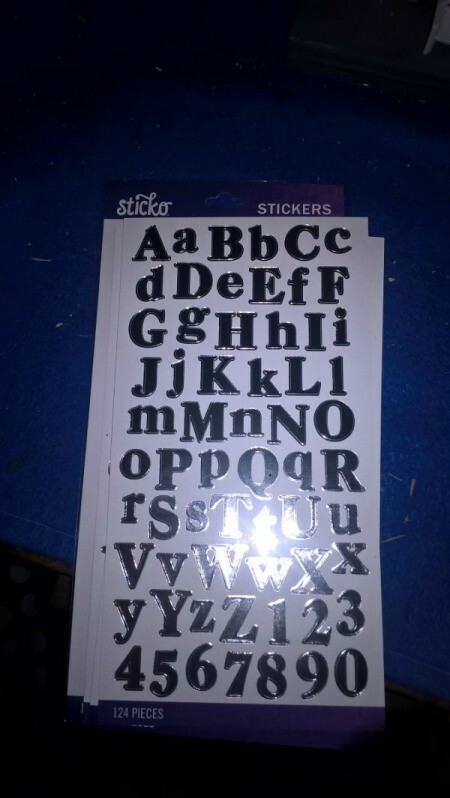 Carefully peel off the stickers. These were pretty stubborn and took a little work to get off. Put the mug on a cookie sheet and put it into a cold oven. You don't want to add this to a pre-heated oven, or it may crack! Turn the oven on to 425 degrees F. Once the oven is pre-heated, set your timer for 30 minutes. It's a good idea to open a window because there is a slight odor when you are doing this step. It's not super strong, but it may bother some. After 30 minutes, turn off the oven. Leave your mug in there. Once the oven is completely cooled, take the mug out. Some of the colors of the dots changed. I was bothered by this, but have since read that it's normal. Next time, I will only use 2 colors, since it looks liked I only used 2 or 3 colors! The instructions say that you can put this in a dishwasher without it taking off any of the marker. I can not attest to this, because we don't have a dishwasher. But, it is holding up nicely with hand-washing! Attosa- I didn't even think about that! 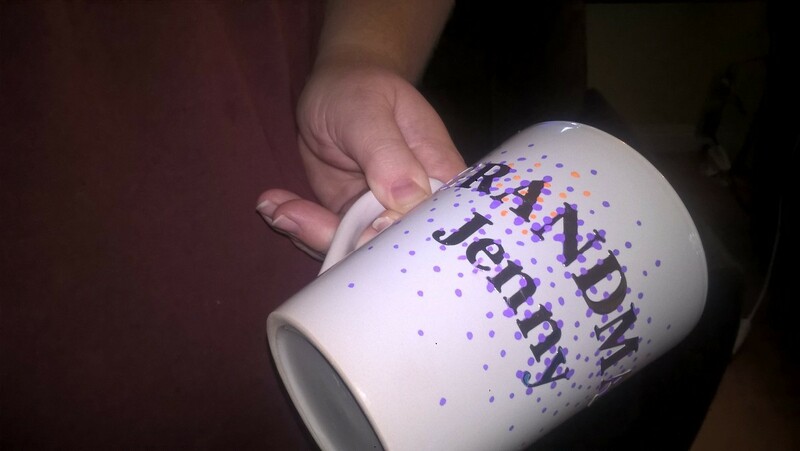 Well, I'm sure you will do a great job on your personalized mug. Thanks.